Definition of: SFP SFP: (Small Form-factor Pluggable) A small transceiver that plugs into the SFP port of a network switch and connects to Fibre Channel and Gigabit Ethernet (GbE) optical fiber cables at the other end. Superseding the GBIC transceiver, SFP modules are also called "mini-GBIC" due to their smaller size. By choosing the appropriate SFP module, the same electrical port on the switch can connect to fibers of different types (multimode or singlemode) and different wavelengths. If the fiber is upgraded, the SFP module is replaced. The SFP converts the serial electrical signals to serial optical signals and vice versa. SFP modules are hot swappable and contain ID and system information for the switch. Combo SFP Ports Combo ports are paired with Ethernet ports. For example, if an SFP transceiver is plugged into SFP port 24, then Ethernet port 24 is disabled even if a cable is plugged in. XFP and SFP+ for 10 Gigabits Larger than SFP, XFP transceivers were the first to handle 10 Gigabit Ethernet optical lines, because SFP supported only up to 4.25 Gbps. The same module size as SFP, SFP+ was later introduced to handle 10 Gbps but required more circuitry in the host device. As a result, SFP+ ports are mostly found in plug-in cards for servers and enterprise switches. See transceiverand GBIC. 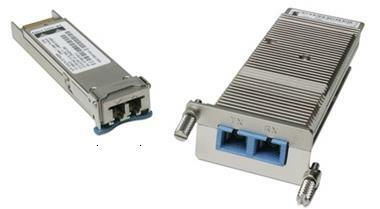 SFP+ and XFP Modules SFP Gigabit Ethernet and SFP+ 10 Gigabit Ethernet transceivers are the same size. In this view from the optical fiber side, the SFP+ module (left) is obviously narrower and shorter than the XFP module on the right.